The installation shot is from an exhibition I did called “Blanks” at Elizabeth Dee Gallery in 2014. The “Buddy” image is of some of the mathematical calculations I do to determine the scale and location of the images within the area of the painting. in this case, the initials of my name. The math thing came about because of an experience I had seeing a Barnett Newman painting called “The Gate”, at the Stedelijk Museum in Amsterdam just after graduate school in 1985. Looking at the work, I had the feeling that my body and my eyes were telling me two different things about where the center of the work was; and were directing me in my physical and feeling response to it; and suspending the duration of the experience. I developed this “crackpot” math thing which has to do with converting the aspect ratio of the format for a better understanding about the specific area as a felt space—mostly because I wanted to get out of the composition business which always felt to me like stage direction, and which seemed to make the painting’s feel episodic. Wheel of Fortune (U.S. television game show), video still, c. 2016. Unexplained phenomena, artificial light, and the relationship of painting to social change are subjects that are central in my work. I often approach a painting as if it were a performance in a dysfunctional theatrical play. As if producing for a film set, I try to build up moments by choreographing values of light and dark, by creating tensions, and by reconfiguring what looks familiar to appear new or strange. I see my canvases as stage-like spaces where I can manipulate my own sublime, and weave cryptic narratives for viewers to decode. My source material comes from personal experiences, as well as ideas and images from newspapers, Game shows on television, and overheard conversations. I am drawn to dual and alternate realities—such as mysterious relationships that form in nature, or the deepest fears that dwell behind everyday life. I clip images from my experiences and the media, and strip them of their stories, allowing me to draw from disparate sources and destabilize absolute meaning in my paintings. Brian Edmonds. Crimewave (2016). 16 x 12 in. Acrylic on canvas. The spacing and color of Crimewave make it an interesting one to read. The eye is forced to contend with the positive/negative spaces and how to digest the markings. Am I looking at a flat field of pink marks or a structure that is beginning to collapse under its own weight? I started in the top left corner, moving in increments towards the middle, then bouncing back to the bottom left corner. I did the same from the top right, to the middle, then the bottom right. From there the painting organically evolved. I contemplated each mark, thinking about the space between each and its relationship with neighboring marks, as well as those in various locations. I wanted to make a painting that looked simple in execution but forced the eye to think about what and how to read the picture. To make decisions and judgements. To connect the dots in a personal way. Just as one would look to the night sky and try to make sense of it all. The same can be said for Matisse’s painting Porte Fenêtre à Collioure. The painting has been a favorite of mine for many years. Matisse had a great touch. His paintings were complex investigations of time and space. Think also about The Piano Lesson and The Bathers by the River. I want to read the painting as a positive/negative space. Matisse pushes our gaze further inward toward a window, one that looks more like a door to a dark, heinous room or a portal to another place. The painting is a great example of leading the viewer to a place to think about and question what he or she is looking at. To make decisions and judgements. I use abstraction as a means to communicate poetic expression. I oscillate between thought and sensation. I chose this wonderful map as my buddy image as I have admired these maps for eons. The existing relationship between the works of these celestial cartographers of the 17th century and the cosmic relationship to the human spirit has nourished my own art practice. 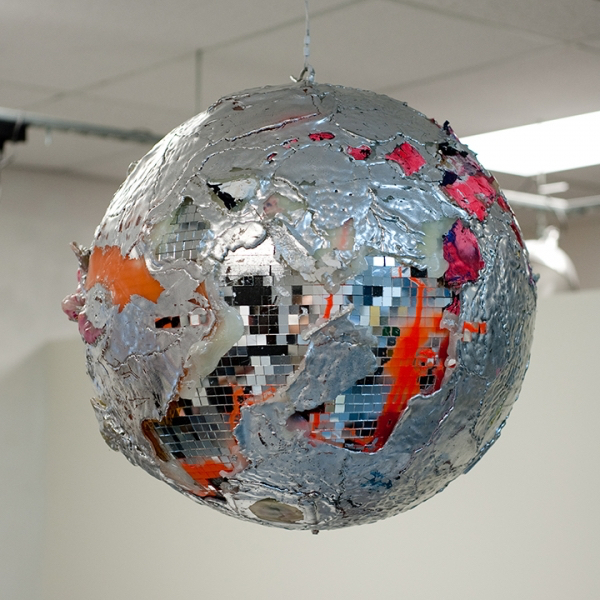 Jay Henderson, Revised Information, 20 x 20 x 20 in., 2010-2014, Hot-glue, disco ball, theater lighting gels, arcylic paint, spray paint, cardboard, and aluminum leafing. I teach art to a variety of people from ages 10 to 50+ at a private college prep school and a community college. Most of the students I teach would be considered to be at the foundations level, regardless of age. The artistic backgrounds and exposure to art vary tremendously across all ages, and this affects student’s ability to try new ways of making art or making new types art. In response to this varied background/cross-­‐generational teaching situation, I have attempted to develop a curriculum that teaches technical skills & concepts in the context of making individually imaginative artwork. The curriculum is adjusted only slightly for different age groups. Importantly, the curriculum has grown directly out of my own interdisciplinary studio practice and varied experiences as an artist. Using simple instructions, the projects generally cover the connection between real and depicted space through shading, linear perspective, isometric perspective, line weight, observational drawing, symbol studies, personal color studies, texture studies, and 3D paper constructions. The media is generally limited to graphite, colored pencils, gouache, watercolor and ink. While the instructions I give are fairly straightforward (“Draw a line, fill every shape with a gradient, make a shape with 3 different line qualities…”), they can be interpreted and applied by the students in an infinite number of ways. I like to think of this method of teaching as asking objective questions that can be answered with multiple correct and subjective responses. These instructions also reveal the malleability of language and the unique ability of visual art to simultaneously communicate seemingly contrasting ideas. The instructions are often in the form of changing or erasing something that has already been drawn. For many students, they have never thought of erasure or covering as being a meaningful and intended mark. But this process of erasure and experimentation carries with it the echoes of all the past work that went into the final work. In a sense, it is integrating layers of time into a flat picture. The projects are sequential. When a project is complete, it forms the basis for the proceeding project. One of the reasons for this is so that students actually make a cohesive body of work that grows organically and allows them to develop a personal style through the discovery of personal tendencies. This way of teaching reflects the ideologies and tendencies revealed in my own studio practice: a continual attempt to make and re-­make some thing into a new thing, where processes and ideas merge within a single medium in a search for beauty through material inadequacies. In my process, things fall apart, but ultimately come back together in a dance between design and chance. In a sense, a striving for perfection with the acceptance that imperfection will continue to exist. This painting is an example of a recent group of small pieces I have been working on in the studio. I start these by laying down blocks of color. On and into this field, I draw (with the brush), usually layering two or three different drawings on top of each other. 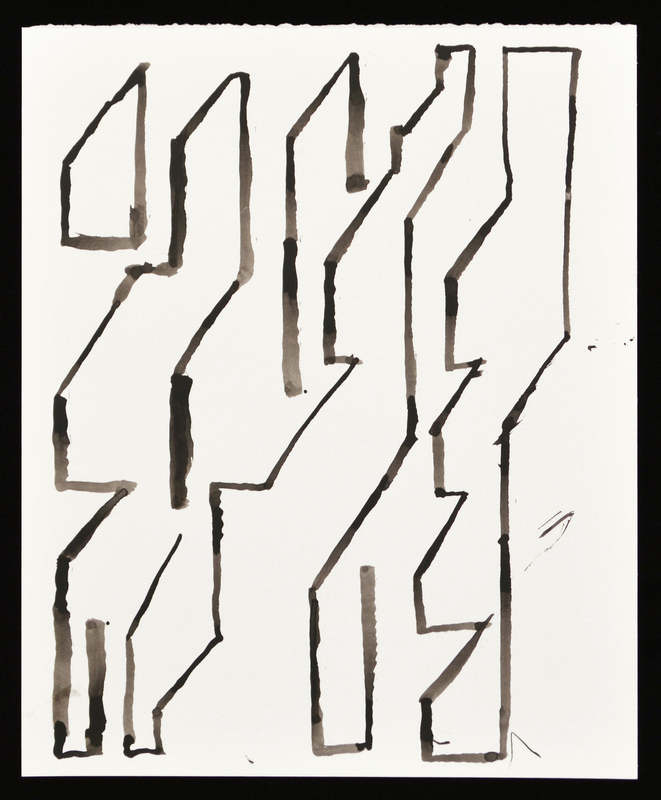 I edit and erase into the ground and the drawing, paring down the form into a linear, dimensional structure. 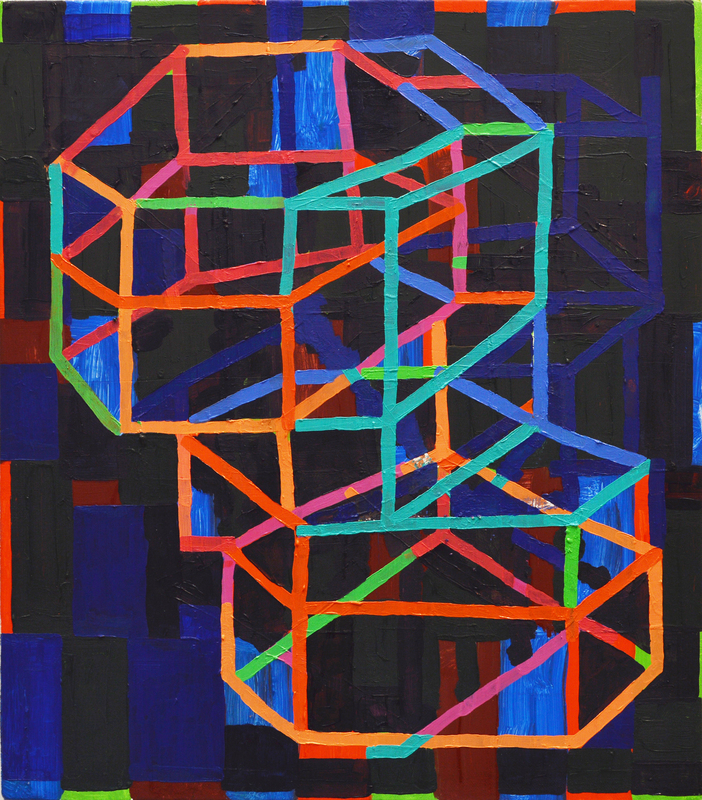 The painting gets resolved when the color, light, and structure synthesize into one thing. It is generally geometric and abstract, but also exhibits much of its own history, as well as hints at representational elements. In and around my studio time, I walk around the neighborhood in northwest Brooklyn. On the weekends, I often take day trips to the perimeters of the city, places like Jamaica Bay and Pelham Bay Park. During my breaks from thinking about my work, I inevitably come across things that come back to the studio with me. Signage, colored lights, odd things found on the street, and strange encounters with nature. I am interested in what filters into a mostly formal vocabulary in the studio. The process of drawing is a way to make sense of things I see and experience, and to help build the forms I use in my paintings.